As an ideal iOS devices manager, iOS Assistant for Mac can do what iTunes can't! It enables all Mac users to transfer contacts, SMS, notes, calendars, photos, videos, books and more from iPhone, iPad, iPod touch to Mac, and vice versa, view and search files easily, and even manage all contents on your iOS devices with simple clicks. Stored a lot of precious data on your iPhone, iPad or iPod touch and worry about losing them someday for unexpected reasons? iOS Assistant for Mac features an intuitive workspace to export files from iDevice to Mac, and import data from Mac to iDevice. Export to Mac: Up to 10+ types of files can be exported from iPhone, iPad and iPod touch to Mac, including contacts, messages, notes, calendars, bookmarks, music, videos, photos, books, apps, etc. 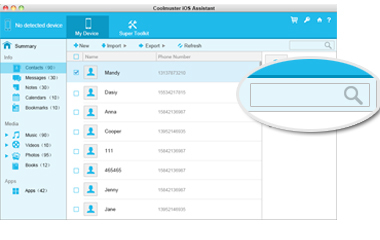 Contacts can be exported as CSV, VCF and XML files, and SMS can be saved as CSV, HTML, TXT and DB formats. Import to iDevice: You can effortlessly import any files like contacts, calendars, books, bookmarks and many more from the Mac to your iPhone/iPad/iPod devices. Please be noted that iTunes should be installed on your desktop computer for using this powerful program and currently the notes are not supported in iOS 11 or later. Manage Everything on iOS Devices: Do What iTunes Can't! 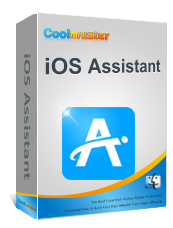 As an ideal Apple devices manager, iOS Assistant for Mac lets you manage almost everything on your iPhone, iPad and iPod touch. After you connect your iDevice to Mac, the program will show all the files that you can manage, whatever the file formats are. Access and preview different types of files like contacts, messages, notes, calendars, photos, apps, music, etc. on iPhone, iPad or iPod on Mac directly. 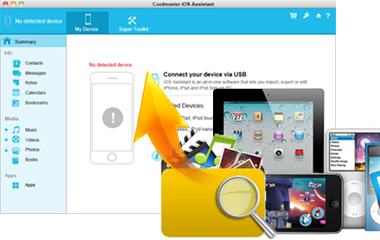 Uninstall or remove any unwanted apps from iOS devices with 1 simple click. 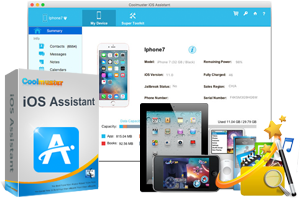 Import contacts, calendars and bookmarks in XML format from Mac to iPhone, iPad or iPod. Apple allows you to easily backup iOS data to iTunes but it does not offer a simple way to access and manage iTunes backup files. As an all-in-one iTunes Backup Manager, this iOS Assistant for Mac can be totally relied on to manage iTunes backup files for iPhone/iPad/iPod directly on Mac to meet all of your needs. 1-click backup iOS data to iTunes in default backup location or customized folder on Mac. 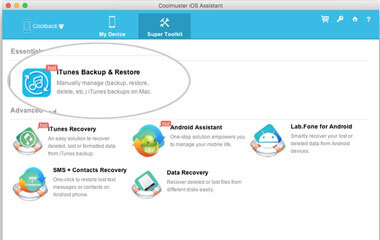 1-click restore any iTunes backup file to any iOS device on your request. Import iTunes Backup files from Mac to iPhone/iPad/iPod after selection. Delete unwanted iTunes backups for iDevice on Mac to clear up space. 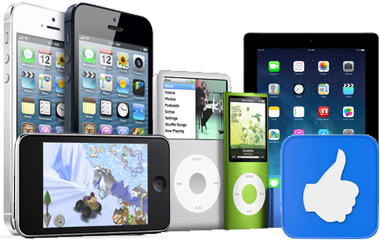 Many users take the iPhone, iPad and iPod touch as removable storage device, in which they tend to save thousands of different files. Too many files stored in your device, making it difficult to locate a specific file in a short time. Fortunately, iOS Assistant for Mac comes with considerate built-in quick filter and search function. If you can remember the full or part of the file name that you want, then type it, no matter one or two keywords, or a part of the title, in the searching box of the panel. And this app will search and locate the file for your reference. If you can't remember the file name exactly, don't worry. You can preview and find files by entering different folders in the left panel. You're allowed to search through your files by genre, artist's name, album name, album year and others. iPhone: iPhone 8, iPhone 8 Plus, iPhone X, iPhone 7 Plus, iPhone 7, iPhone SE, iPhone 6s Plus, iPhone 6s, iPhone 6, iPhone 6 Plus, iPhone 5s, iPhone 5C, iPhone 5, iPhone 4S. iPad: iPad Pro, iPad mini, New iPad, iPad 4, iPad 3, iPad 2, iPad 1.
iPod: iPod Touch, iPod mini, iPod classic, iPod nano, iPod shuffle. Supported OS: iOS 12, iOS 11, iOS 10, iOS 9, iOS 8, iOS 7, etc. No matter you're a novice or an expert, you can handle this powerful program at seconds. Identify and list detailed info of your iDevices automatically, including model, capacity, format, version and serial number. 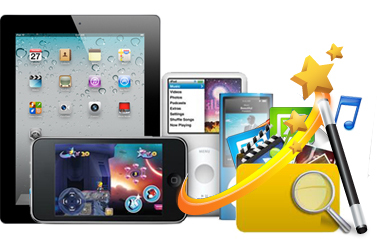 With this software, your iPad/iPhone/iPod can be used as a portable hard drive perfectly. 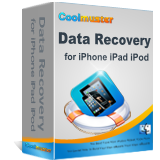 One-click to recover lost, deleted or formatted data from iTunes backup files. One click to transfer photos, videos, music, books, contacts, and anything you want from iPad, iPhone and iPod to Mac computer.